Does muscle really weigh more than fat? Many people indeed say so. Let's find out the truth. 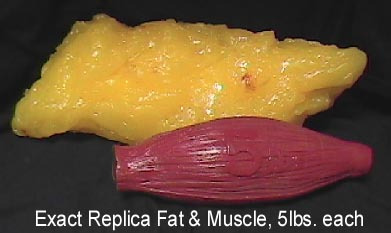 What weighs more ‒ muscle or fat? 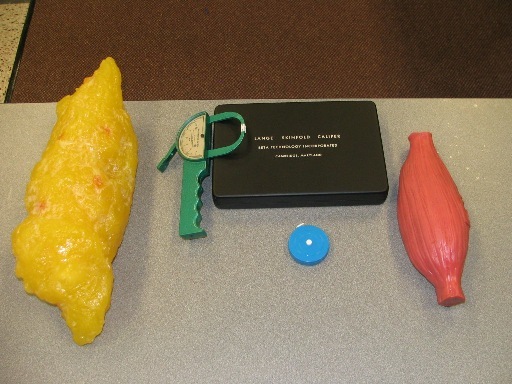 Sample, 5-lbs of fat (yellow) vs. 5-lbs of muscle (red) with assessment tools. The statement that muscle weighs more than fat is as wrong as, say for example, a stone weighing 1 kg weighs more than a piece of wood weighing same. It doesn't. 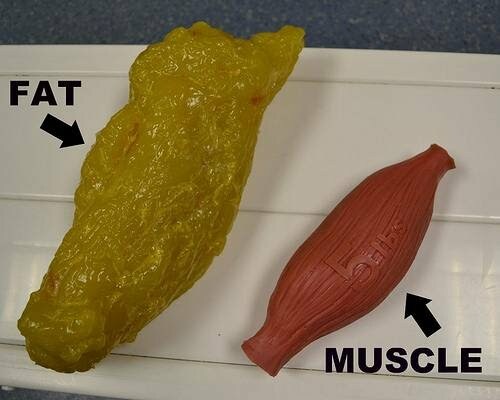 FACT: Muscle DOES NOT weigh more than fat. Fat is bulky and lumpy so if you carry an extra 5 pounds (about 2.3 kg) of fat, you'll be lumpier than with 5 pounds (about 2.3 kg) more muscle. A kilo of muscle and a kilo of fat placed on a scale would both weigh exactly the same. A kilo. It is something we come to terms with when comparing feathers and lead, but it seems subliminal to many with reference to body composition. 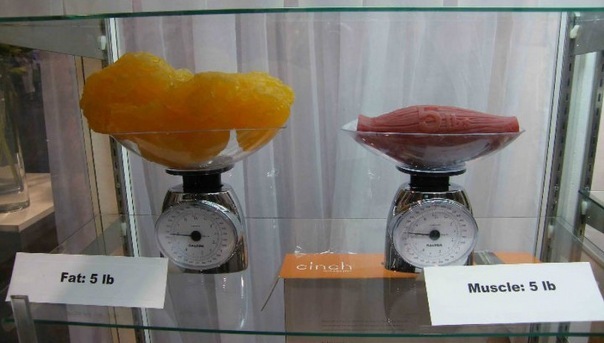 What people are really comparing is not weight, but density and volume. Muscle tissue has greater density than fat tissue and so fat has a greater volume. Or more strictly speaking muscle has more weight by volume. 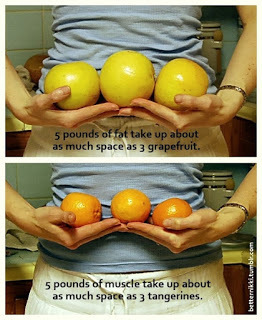 Imagine if a kilo of muscle was the size of a grapefruit, a kilo of fat would be 3 times larger. This could mean a significant difference to body composition, shape, size and health when the percentage of your body fat changes. A five pound pile of fat will take up more space (volume) than a five pound pile of muscle; but five pounds is still five pounds. A woman weighing 150 pounds with 19% fat will look much smaller (and be much healthier) than a woman at 150 pounds with 35% fat. They weigh the same, yet the composition is different. Because muscle is more dense than fat the person with less fat and more muscle will look smaller.